Our resistance has broken down for crown rust in oat across Ontario,” says Peter Johnson, cereals specialist for the Ontario Ministry of Agriculture, Food and Rural Affairs. Oat crown rust is a serious threat to Ontario growers, mainly because the existing resistance in available varieties has broken down. 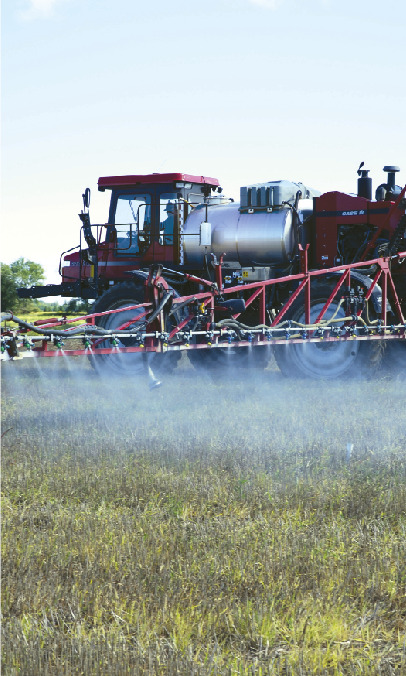 One of these ramifications is that, because the variety performance trials are not sprayed with fungicide, the yield results may be difficult to interpret for growers who think they will need to use a fungicide. For example, Johnson compares recent oat yield index results with those from several years ago, before resistance to crown rust (Puccinia coronata var. avenae) was overcome. He refers to Performance Trials for Spring Cereal Crops, available from the Ontario Cereal Crop Committee (OCCC) at www.gocereals.ca; oat yield and characteristics are found in Tables 7 and 8 prior to 2008 and Tables 5 and 6 for 2008 and 2009. He points out that two varieties that once had a yield index in the range of 120 to 140 percent now yield between 85 and 100 percent of the average site yield. But some varieties that had below-average yield indexes in the past can now produce above-average yield indexes if they still have some resistance to crown rust. further study is needed as resistance continues to break down, says OMAFRA’s Peter Johnson. Falk notes that in the 2008 performance trials (Table 6a,b), some varieties suffered from three or four times as much crown rust as others. “The degree of rust susceptibility definitely has an impact on yield, and if you were to spray so that there was no crown rust, then the one that originally had more rust could, in fact, outyield the one that had less.” To understand how the relative yields might differ in the presence and absence of crown rust, the OCCC is implementing a pilot project in the 2009 growing season to compare oat performance with and without fungicide at three locations. Luckily for growers in northern Ontario, Quebec and the Maritimes, crown rust is not high on the list of disease concerns. It is most successful in regions where humidity is high and the introduced shrub European buckthorn (Rhamnus cathartica) is abundant. European buckthorn is crown rust’s alternate host; it provides habitat for rust overwintering and sexual reproduction, and facilitates the quick development and maintenance of mutations in the rust that allow it to overcome resistance. The humidity and European buckthorn abundance are favourable for crown rust in southwestern and eastern Ontario, putting the disease at or near the top of concerns for oat growers in these regions. Where crown rust is common, the breakdown of resistance to it has tended to occur fairly quickly, usually within 5 to 10 years of resistance gene introduction, with some exceptions. 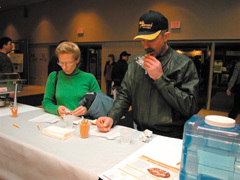 “Oat breeders spend a lot of effort in trying to breed for more durable resistance,” says Dr. Weikai Yan, research scientist and oat breeder with Agriculture and Agri-Food Canada (AAFC) in Ottawa. However, there are several obstacles. Most of the currently known crown rust resistance genes are single genes with simple inheritance. They tend not to be very durable because the disease organism can usually overcome the resistance by a single genetic mutation. hus, oat breeders aim to insert, or “stack,” multiple resistance genes into high-yielding germplasm. However, because most of these resistance genes are dominant genes, it is difficult to confirm whether a resistant variety has more than one without using genetic markers, which are generally not yet available for oat. Another type of resistance, called quantitative resistance, can provide differing levels of disease tolerance. It is generally more durable because it involves numerous genes, but it is also more difficult to identify and manipulate in the germplasm. The development of genetic markers would also facilitate the inclusion of quantitative resistance into oat varieties. Another limitation to speedy oat variety development is that very few researchers and breeders in North America work with oats, and some of those that do are approaching retirement. “In the United States, they have fewer and fewer people working on oats because they grow less and less of them,” says Yan. “Canada is the biggest grower of oats after the Russian Federation, yet we only have two oat breeders within AAFC.” This might seem disadvantageous for a country that produces two to three times the oats grown by the United States and is a major supplier of oats to the United States.Yan is working with several resistance genes that are still effective in Ontario, including Pc61, Pc91, Pc94, and some newer, unnamed genes. “We are trying very hard to put all the effective resistance genes that we can find in the same germplasm,” he says. Our lines that are currently in registration trials all have an older crown rust gene, Pc61, which is still very effective in Ontario.” AAFC is hoping to release one or two lines that contain one or more of these effective genes by the end of 2009.Because of the current crown rust susceptibility of most Ontario oat varieties, though, one thing is clear for oat growers in southwestern Ontario and the Ottawa Valley, notes Johnson. Those who are growing high-quality oats for premium markets such as horse feed or milling for human consumption will have to spray a fungicide at the flag leaf stage to control the rust and obtain good oat quality. Our one oat variety that you might not have to spray is ‘Robust.’ It looks like it still has crown rust tolerance and it has decent yield potential,” says Peter Johnson, cereals specialist for the Ontario Ministry of Agriculture, Food, and Rural Affairs. However, until additional Ontario-adapted oat varieties are released that have resistance to oat crown rust, many oat growers might need to consider spraying a fungicide. The fungicide products that are registered for oat do not translocate well in the plant, says Johnson. This means that good spray coverage is necessary, and the flag leaf should be fully emerged before spraying. “Ninety percent of the yield comes from the flag leaf and the penultimate leaf (second leaf down), so we need to keep them free of disease,” says Johnson. Because most of the available fungicides work better as protectants than as eradicants, it is critical to monitor flag leaf development and spray as soon as the flag leaf is fully emerged.